We’re going to ride tonight to celebrate the birth of the one and only David Bowie, the gift of all his music and the wonderful artistry that he was blessed us with! Celebration of the life and music of David Bowie with a mobile dance party and sing-a-long! 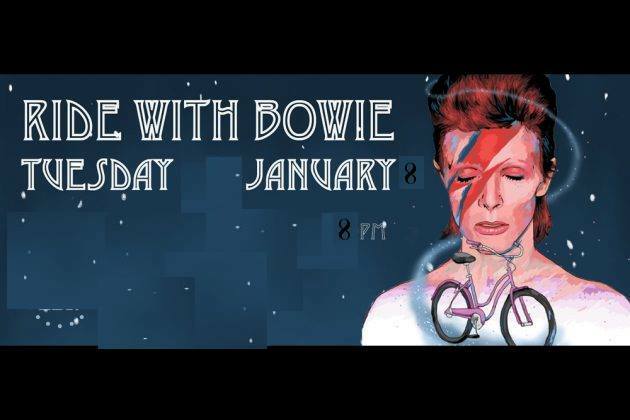 We’ll gather near the Bowie bike lane (near the Arlene Schnitzer Concert Hall) then go for a short ride and end with a group sing-a-long of our favorite Bowie songs. Also feel free to bring instruments to play along while we sing our little hearts our in memory of the one and only DAVID BOWIE! This ride will happen Rain or Shine (but not in icy weather) but unlike Bowie vs. Prince of days of old will not go late and may end at an *adult oriented location (with some WARMTH) for more singing! AND I’ll post the end location as the ride starts here on this event page for those that want to just show up at the end to sing and dance!